The Data Lab is the nerve center of Young Invincibles’ quantitative research. We bring YI’s belief in creativity, diversity, and collaboration to our analysis. Our work involves using unique data sets to illuminate the economic challenges of young adults, mapping out big picture trends, and honing in on specific issues and demographic groups within our generation. The real, personal stories of our generation make data resonate, and we ensure those voices influence what we research and have opportunities to speak to the lived experiences behind the numbers. We also advocate for responsible collection and dissemination of more data to inform consumer choice and public policy decision-making, while protecting and securing personal information. Below are a few examples of recent Data Lab projects. Have a question? Got an idea? Email Tom Allison, Deputy Director of Policy & Research, at tom.allison@younginvincibles.org. Every month, Young Invincibles studies the latest unemployment data for Millennial workforce trends. We routinely look at racial disparities in Millennial joblessness, as well as analyze trends by sector. See our Monthly Young Adult Unemployment Data page here. We love our education datasets at YI, especially those that connect students’ experiences in college to where they end up ion the workforce. But we also care about making those datasets as useful as possible for prospective students deciding where to enroll, what to study, and how to pay for it. 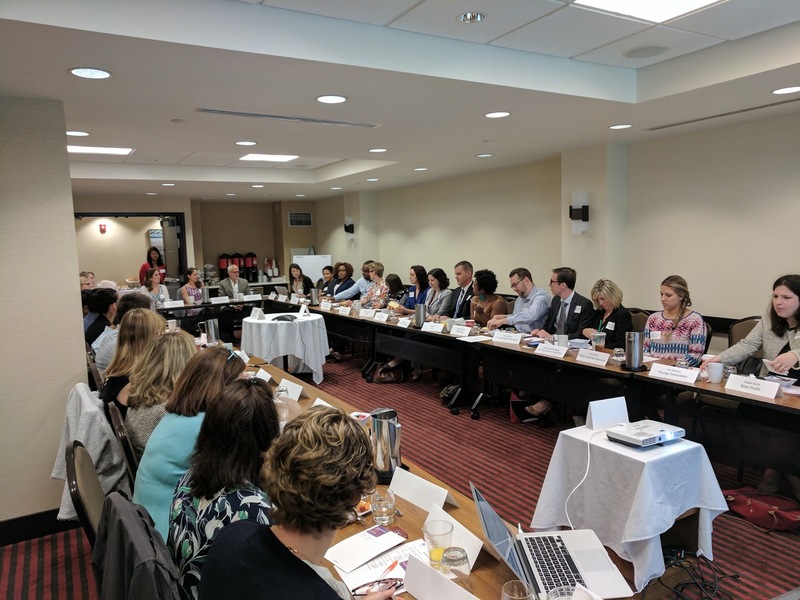 In June we brought technologists, state data stewards, advocates, and college access groups to discuss how to build a better search tool with the data we have. Check out this blog summarizing the event. Policymakers, businesses, institutions, and students share the goal of increasing the college attainment rate for our nation’s students broadly. College enrollment has increased over the last few years, but troublingly, gaps in education attainment between white students and other groups of students have actually been increasing. To understand better how each state fits into the broader problem nationally, we analyzed attainment rates by race and ethnicity in every state and how they compare across different ethnic and racial groups. We identified gaps in the current rates (as of 2015) as well as compared the ten-year change from 2005. The results are troubling. See the full post here. Despite media narratives that young adults would benefit from lower costs under the American Health Care Act (AHCA), the legislation would actually cost billions for this age group. While the bill makes changes across the health insurance system, three groups of young people would be particularly impacted, totaling 17 million 18-29 year-olds: those currently buying insurance on the individual market; low-income people currently enrolled in Medicaid and; those currently uninsured young people making future decisions about their coverage. In order to analyze the AHCA’s impact on young people, we reviewed how changes to the tax structure, cuts to Medicaid and phase out of Medicaid expansion, surcharges to young adults who do not maintain continuous coverage, and an elimination of cost-sharing reductions (CSRs) all negatively impact young adults trying to afford health insurance. We found that of these 17 million young adults most directly impacted, nearly 10 million, or about 58 percent, would pay a total of at least $23 billion more for health insurance annually – or $2,400 per person. See the full post here. Where Are the ACICS Accredited Institutions? Accreditors play a significant role in authorizing colleges to operate, and the schools they approve gain access to hundreds of billions of dollars in federal financial aid every year. Many schools rely on government funding for up to 90 percent of their total revenue. So it is a big deal that the Department of Education took away the accrediting power of Accrediting Council for Independent Colleges and Schools (ACICS), a move that significantly helps protect students from predatory institutions. After all, ACICS accredited seventeen institutions that were under federal or state investigation, allowing them to receive $5.7 billion in federal aid in the last three years. To better understand the outcomes of the 160,000 students who attend these schools, we dove deeper into the actual institutions ACICS accredits and where they’re distributed across the country. 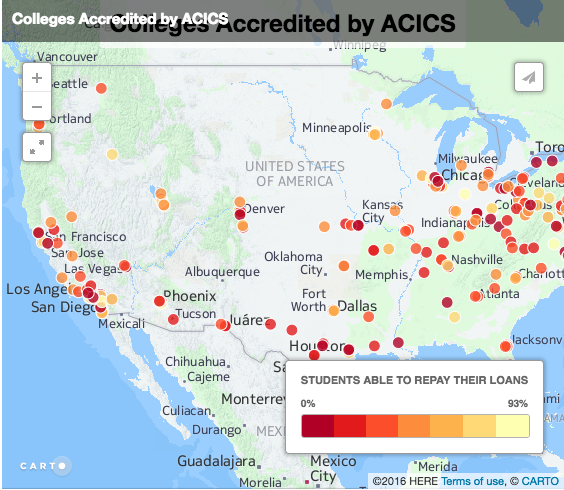 This map links all ACICS accredited institutions with outcomes measures from the College Scorecard, showing how different schools stack up. California led the pack with thirty-six campuses, Florida and Pennsylvania each had twenty, and ten are in Texas. See the full post here. As the economic challenges facing today’s students gain national political attention, it is critical to focus on a growing proportion of our student population – student parents. Indeed, the numbers may surprise you: approximately one quarter of today’s students have children, and fifty percent of these students are single parents. One major challenge facing young parents is access to child care, with some estimates suggesting that we need one million more childcare spaces to meet the need of today’s student parents. But states’ responses to those needs vary dramatically. We mapped out how access to childcare on campus varies by state. In the highest performing states – California, the northwest, and Maryland – about 60 percent of college campuses feature childcare centers. In contrast, in the southeastern states, fewer than a quarter of college campuses in these states feature on-campus childcare facilities. See the full post here.